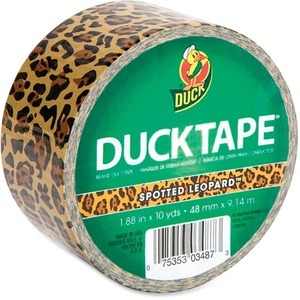 Printed duct tape with a decorative print is excellent for repairs, color-coding, fashion, crafting and imaginative projects. Great stretch and conformability hold tightly around corners, bends and curves. It works on a variety of surfaces, including wood, vinyl, plastic, leather, metal and laminate. Tape is made with heavy-duty cotton mesh for high-performance strength. Rubber adhesive offers excellent holding power. Tape tears easily by hand without curling and conforms to uneven surfaces.